bewitched spirits in the dusk. Really like your composition and texture in this shot. The brown with white specs here and there… nice contrasts. I agree with Ivar. Fantastic composition and super brown. Oh.. an actual cliff walk. This is a really nice composition and the colors are perfect. Whoa! This is startling! I’ve been cruising through your photos and love them all eddie, but this was like a fist the reached right out through the screen, grabbed my shirt front and said, “STOP! Look at ME, I am a force of Nature.” The rock is filled with such powerful magnetism. 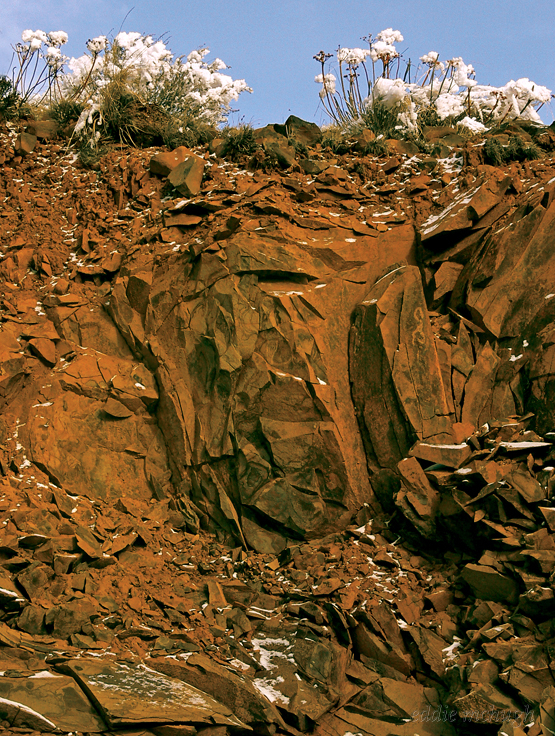 I love rocks to begin with, but this is filled with rich texture, color and force. And then to have the snowy bushes and grass at the top in such stark relief just add to the sense of complete confidence or power. Like when something is not only empowered but it KNOWS it’s empowered. I think rock cliffs and even desert rocks here in New Mexico have phenomenal power and energy. I love to be with them.